Humans have been playing rock music far before Elvis and the Beatles. These oblong stones which date back to the New Stone Age (8000-2500 BCE) were once thought to be grain grinders. 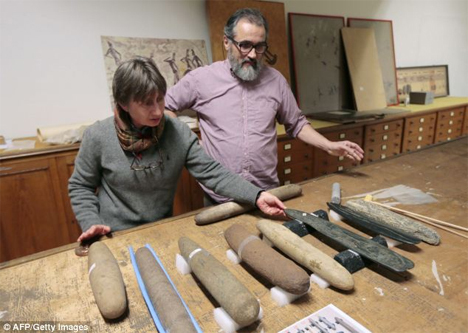 They resided in the storeroom of the Natural History Museum in Paris since the early 20th century. By chance, an archaeologist tapped one with a mallet in 1994 and heard a resonating musical note – and he suddenly realized that these stones were ancient musical instruments. 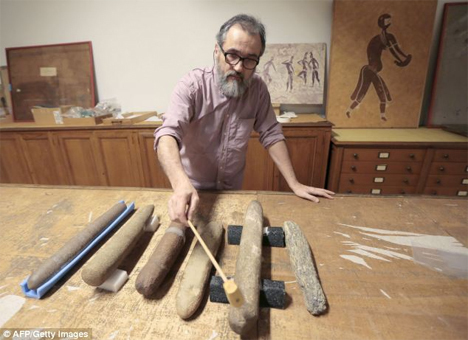 The archaeologist who made the discovery, Erik Gonthier, had to work for several years to convince the scientific community that the stones were more than agricultural tools. Gonthier dug some pieces of foam out of the trash and put them under the stone as rests. He tapped the stone with a mallet again and the same musical tone rang out. 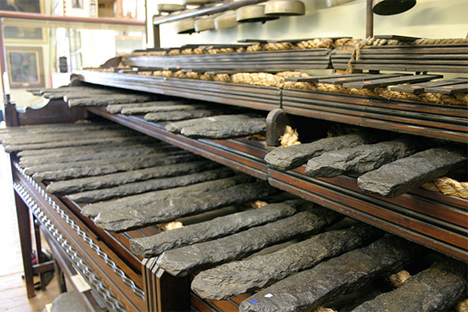 They were eventually classified as lithophones, a combination of the words for “stone” and “sound.” The image above shows a lithophone setup called the Skiddaw Stones which resides in the Keswick Museum in England. The stones at the Natural History Museum mainly originated in the Sahara and were probably taken to France by soldiers stationed in that area in the early 20th century. Made from different types of sandstone, the lithographs probably sounded very similar thousands of years ago as they do today. The stones would have been placed on brackets made of leather or plant fibers to be played, xylophone-style. Although we see them as musical, the lithophones could also have been used to communicate over long distances or to send danger signals. See more in Antique Gadgets or under Vintage & Retro. March, 2014.